ENTRIES: Entry on the day only (EOD). SportIdent (SI) punching will be used for all courses. Hire dibbers will be available. FEES: Senior – £7. Junior – £2.50. SI dibber hire – £1 (Juniors 50p). Lost dibbers £30. Note additional car park charge below. Please note that if you are not a member of an orienteering club affiliated to British Orienteering then you are not covered by our public liability insurance except if you are a newcomer to orienteering, in which case you are covered for three registered orienteering events without joining. Please ask any of our club officials for more information if you would like to join CLARO. By car. From Harrogate, take the A661 direction Wetherby. Take the second exit at the A658 roundabout. Plumpton Rocks is approx 0.5 miles further on the left. From York and the North, go to Junction 47 on the A1. Take the A59 towards Harrogate, then stay on the A658 Harrogate by-pass. Take the first exit at the A661 roundabout towards Wetherby. Plumpton Rocks is approx 0.5 mile further on the left. From Leeds, use the A61 direction Harrogate. At the roundabout junction with the A658, take the third exit, direction York. At the next roundabout take the third exit onto the A661. 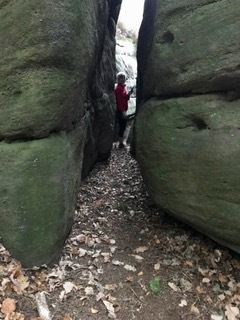 Plumpton Rocks is approx 0.5 mile further on the left. 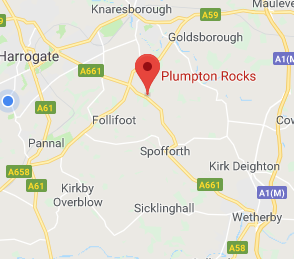 Plumpton Rocks will be signposted from the A661. By Bus: No 7 to Wetherby and Leeds bus from Harrogate Bus Station. Times: 08.00; 09.00; 10.00; 11.10 and 12.15. 15 minute journey. No 7 Buses also run from Leeds via Wetherby: realistically only 09.35 and 10.35 – 1h 15min journey. Tell the bus driver that you want to be set down at Plumpton Rocks– there is no bus stop there. Car parking will be on a rough field adjacent to the Rocks boundary. Space is very limited. Please therefore car-share, if at all possible. There will be a £1 per car charge. Please comply with marshals directions. Start, Finish, Registration and Download will be all together at Assembly in Plumpton Rocks. Prior to Registration you must attend a short briefing to draw your attention to the safety aspects of the area, to help you choose an appropriate course and to introduce you to unusual features and control description listings. Control Descriptions will be available at the Start. Plumpton Rocks is an old landscaped garden. See website:http://www.plumptonrocks.com. As an Orienteering venue it is very small and may be described as bijoux. 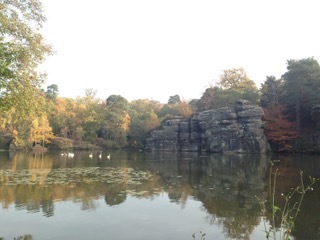 It comprises mostly very runnable woods surrounding an attractive ornamental lake. It’s highlight is an extensive series of rock formations on eastern, southern and northern sides. These are reminiscent of Brimham Rocks, and add up to a complex area with interesting navigational challenges. Those who have run here before will recall that the area offers an amazing playground to orienteers. It is also fiendishly difficult to map. Fortunately for you, Quentin Harding (CLARO) is producing an updated map especially for this event. We think you will enjoy it. Re-mapped by Quentin Harding, November 2018 at 1:3000 with 2.5m contours. To improve read-ability, most small paths have been removed. All crags are enormous. In places the small crag symbol is used to aid clarity. You can not climb over any of them. Vegetation is approximate and should be used for guidance rather than navigation. Do acquaint yourself with the cave symbol used on the map and descriptions. Other unusual descriptions include ‘narrow rock passage’ and ‘firm ground in a marsh’ used to indicate your control is on an island (you do not need to wear your armbands). This is a Middle Distance race so course lengths appear short. You are not advised to run up. The area does not lend itself to a White course. Parents who wish to shadow their junior round the Yellow should do so after their own run. The bold White course competitor could tackle the Yellow course as the area is contained around the lake so the opportunities for disappearing are limited. Short Blue and Blue will use 2 maps printed back-to-back. DOGS: No dogs on courses please, although they are accepted on a lead at Assembly. SAFETY AND RESPONSIBILITY: Competitors take part at their own risk and are responsible for their own safety. If travelling alone, please leave your keys at registration so that we know you have returned. All competitors who start must report to Download even if they retire. In the unlikely event of cancellation, details will be posted on the CLARO website – www.claro-orienteering.org.uk. Information can also be obtained by phoning the organiser. RESULTS: These will be posted on the CLARO website www.claro-orienteering.org.uk.